Van Buren City Hall is located at 1003 Broadway, Van Buren, AR 72956; phone: 479-474-8936. Photo: Colonel John Drennen House (also known as the Drennen-Scott House), ca. 1836, 222 North 3rd Street, Van Buren, AR. Listed on the National Register of Historic Places in 1971. 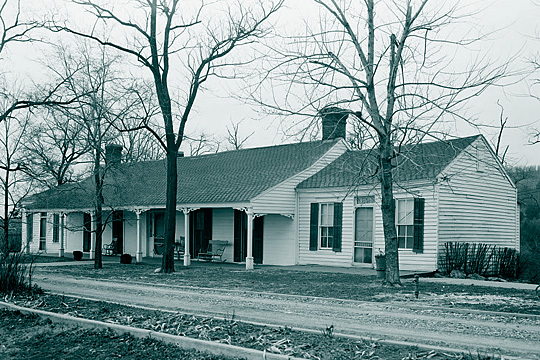 Photographed by Lester Jones, 1972, Historic American Buildings Survey [HABS AR-21], memory.loc.gov, accessed October, 2012. Van Buren, seat of Crawford County, would be known primarily as a once-important frontier post and stagecoach stop which eventually became subordinated to the adjoining city of Fort Smith, had it not been given national publicity by the radio programs of a popular humorist: large signs now inform the visitor that Van Buren is the home of Bob Burns. The inventor of the "bazooka" stems directly from the line of frontier humorists that includes Bret Harte, Mark Twain, and Opie Read. His mosquitoes that can be identified by the two-inch white spot between their eyes come from the same zoological dream book that produced the jumping frog of Calaveras. Burns' exaggerations concerning his mythical kinfolk have made Van Buren seem to radio audiences an isolated village in the remotest Arkansas backwoods, and some Arkansans feel that Burns does the State a disservice in helping to perpetuate the fable of the hill-billy in connection with it. Yet Van Buren loves him and celebrates his periodic return to the town. There were settlers at Van Buren as early as 1818, but the place was known as Phillip's Landing until 20 years later, when two promoters named David Thompson and John Drennen purchased the site, renamed it for President Martin Van Buren, and made it the seat of Crawford County. The site of the village on the Arkansas River, at the edge of American territory and across from the military post of Fort Smith, made it an outfitting place for expeditions into the Indian country and Texas, and a distributing point for goods shipped up the river.